Orgues Létourneau has been an international leader in pipe organ design, construction, restoration and tonal finishing for over 40 years. Our pipe organs are conceived as engaging musical entities combining rich, balanced colours with precise, responsive key actions that encourage virtuosic playing. 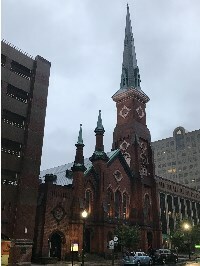 Market Square Presbyterian Church of Harrisburg, Pennsylvania has signed a contract with Létourneau Pipe Organs to completely rebuild the church’s pipe organ. The project will begin with the removal of the entire instrument from the church, including the Positiv division currently on the gallery rail, to allow for the reconstruction of the church’s two organ chambers. 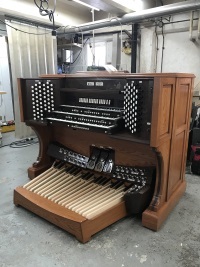 The existing electropneumatic wind chests will be fully reconfigured to suit the new tonal plan while a new four-manual console will be built. 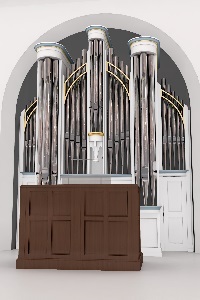 Similar to the present, part of the rebuilt pipe organ will be displayed within a new case across the back of the church’s gallery. Nearly three-quarters of the rebuilt instrument’s pipework will be restored from the church’s previous organs by Æolian-Skinner (Opus 1048 from 1947) and M.P. Möller (Opus 11805 from 1991). When complete during the third quarter of 2020, this pipe organ will be our Opus 136. 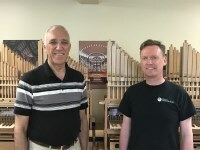 The development and construction of the eight OrgelkidsCAN organs is officially complete with a recent visit from the Royal Canadian College of Organists’ Rick St-Germain to pick up the instruments in St-Hyacinthe. Early reports from Saskatoon are that kids from 6 through 13 years old are universally taken with these “hands-on” instruments! The RCCO is preparing for the national launch of the Orgelkids CAN programme on October 1st. Visit their website at www.orgelkidscan.ca. 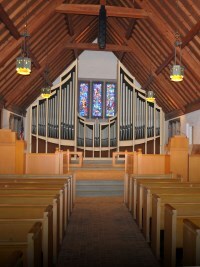 Létourneau Pipe Organs has been chosen by Michigan State University to build a new pipe organ for their Alumni Chapel. This all-new instrument of 36 ranks will be the second Létourneau on the MSU campus, the first being a portative organ in Fairchild Theater. A flexible two-manual design, the specification necessarily reflects the instrument’s many roles for teaching, practice, recitals, and choral accompaniment, as well as complementing the many ceremonies that take place in the chapel (including approximately 160 weddings annually). Létourneau’s Opus 134 will take the place of the chapel's long-silent Pels pipe organ from 1953; installation is planned for 2020 upon the completion of chapel renovations. We have recently signed an agreement with Colonial Church of Edina, Minnesota to significantly improve their 1978 M.P. 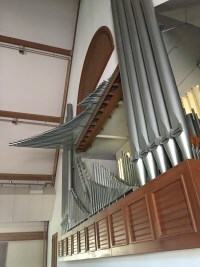 Möller pipe organ. Among other changes, we will equip the instrument with a rebuilt console from our inventory, a new switching system by Solid State Organ Systems with a suite of wireless features, and major tonal modifications including ten new ranks. All of the remaining Möller pipework will be thoroughly revoiced. When complete in early 2019, the instrument will have 59 ranks over three manuals and pedals. 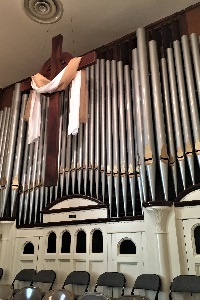 The new pipe organ at Christ Episcopal Church in Tuscaloosa, Alabama is now complete. Opus 132 (III/38) will be heard publicly for the first time at the Easter Vigil as well as at the following morning’s Easter services with the church’s organist, Scott Roberts, at the console. The completion of the instrument will be celebrated at a dedicatory evensong on Sunday, April 15th at 6pm. Mr. Roberts will also play for the instrument's dedication and evensong while organist Tyler Canonico will play a recital of works by Locklair, Langlais, Bednall and others before and after the service. The new console for St. Paul's Lutheran Church in York, Pennsylvania is now complete in our workshops. The console will play the church's Casavant Frères pipe organ from 1941 (Opus 1690) with 62 ranks spread over three manuals and pedal. As part of the project, the instrument has been rewired for new coupling and capture systems by Solid State Organ Systems. We are delighted to announce that we will be working in partnership with the Royal Canadian College of Organists (RCCO) to deliver a unique educational program introducing next generation of children to the wonders of the pipe organ. The program, dubbed OrgelkidsCAN, gives children an opportunity to learn about, build, and play a miniature pipe organ. As noted in the press release, “The new initiative leverages the internationally-acclaimed craftsmanship and innovation of Orgues Létourneau to produce the OrgelkidsCAN kits that will be paired with a curriculum guide offered by the Royal Canadian College of Organists... As children assemble the organ, they apply physics, mechanics and sound theory while discovering the beauty and music of the pipe organ in a fun and meaningful way.” The OrgelkidsCAN program will get underway next September and will be available to Canadian schools and community groups across the country for a nominal fee. 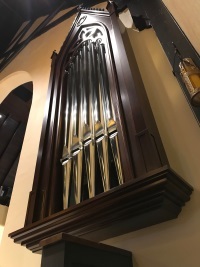 Waldensian Presbyterian Church in Valdese, North Carolina has chosen Orgues Létourneau of Saint-Hyacinthe, Québec as their organ builder to design, build and install a new 19-rank pipe organ in their historic church. Létourneau’s Opus 133 will reside within a painted case located in the apse at the front of the church from where it will speak directly down the nave. The organ’s two-manual console will be detached and reversed from the organ case and will have mechanical key action. The ebony stopknobs will be in terraced stop jambs and will operate electrically, permitting a complete combination action with 100 levels of memory. Completion is expected for Advent 2017. We are delighted to publicize the commissioning of our Opus 132 for Christ Episcopal Church in Tuscaloosa, Alabama. A three-manual instrument with 35 ranks, the organ will reside in the organ chamber on the epistle side of the church chancel. The organ’s specification is inclined toward the Anglican service and will include two expressive divisions, a grand Swell reed chorus, several orchestral reeds, and an array of contrasting string colours with accompanying celestes. The instrument’s installation is expected in early 2018 following a major renovation of the church’s interior; completion is anticipated before Holy Week. 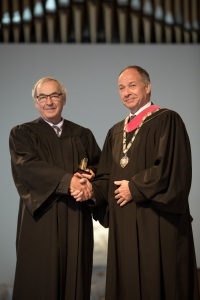 We are pleased to announce that the Royal Canadian College of Organists has awarded our company’s President and Founder, Fernand Létourneau, their Award of Excellence. Given for a significant contribution to the promotion and value of the organ and its music in Canada, Mr. Létourneau was singled out as “one of the finest organ builders in the world” and it was noted that the company’s instruments “reflect artistic excellence in every respect, including exquisite voicing.” Mr. Létourneau received his prize on Wednesday, July 13th as part of the convocation at this year’s RCCO’s convention in Kingston, Ontario. The photo shows Mr. Létourneau shaking hands with the outgoing President of the RCCO, James Bailey.